How the town of Shillong figures in Indian writing in English is a new critique in this body of literature. It is, in a way not new. Since the 1980s, poets like Robin S Ngangom, Desmond Leslie Kharmawphlang have used Shillong as a backdrop for their poetry. The hills, the streams, and the pines recurred as poetic motifs. More significantly, however, they revealed an extension of poetic minds, seeing in nature, both the past and the present. The archetypal nature was decoded. Myths and legends were infused in their poetry. For instance, the myth of Nohkalikai —the waterfalls in Sohra— where a father killed his step-daughter, grieving his wife to the point of madness. More and more myths and legends entered the poetry of such poets. The land of seven huts featured prominently: U Hynnietrep and the creation myth associated with this. This led to the folk tales, myths and legends getting academic interest and deriving versions in English from the spoken and not the written word. This was because the source was an oral tradition and not written. The oral tradition entered writing in English through these poets, leading to a poetic robustness —a recall of memory, tradition, a love for the past and a resurgence of the oral tradition— now, with a difference in the written word. Folk mannerisms, the 'tales' were infused into English poetry by the poets of Shillong. Even then the hills were never forgotten by these poets and it kept searingly dominating their poetic landscape. In the wake of a society in social and political transition, these hills were and continue to be, motifs of pristine beauty, a way of life and a metaphor of truth. The social and political transformations however, led to a social crisis, and created a divide between insiders and outsiders. This has been reflected in novels and short stories such as Anjum Hasan's Lunatic In My Head, Siddhartha Deb's A Point Of Return, Janice Pariat's Boats On Land, and the very recent Shillong Times by Nilanjan Choudhury. All of these writers are either from or have at some point, lived in Shillong. Here in fiction, the trajectory is different in the sense that while the socio- political does get focus, it is mainly used only as a literary backdrop. What happens further, and a point that is missed out is either way —whether the protagonist is an insider, or an outsider, or even an insider/outsider— he is firmly wedded to the town of his love. This is inescapable even when he lives in the boundaries of the hills. In this context, the novels of Deb and Chowdhury especially comes to my mind. Thus this Shillong motif has been worked and reworked in both poetry and fiction since the eighties and continues even today.This should be a focal point of critical interest. This is giving North-East Indian writing in English a new flavor, and a history for literary recapitulation. While the poets are revivalists, the fiction writers are 'survivalists'. 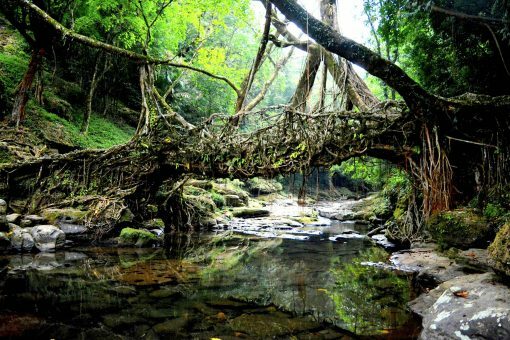 Even though they do not live in Shillong, they survive in its memories, the serpentine streets, the sacred forest. The poets too survive in decoding the past, and recapitulating origin stories and myths. This survival and the revival are essentially and quintessentially, obverse realities —two sides of the same coin that is Shillong.